I read an article recently about a murder trial in New York. The author described the evidence in the trial as something each side, prosecution and defense, turns into a narrative they tell to the jury. The jury believes the side that tells the most compelling story with the evidence they have. I’m not doing justice to the eloquent way she described it, but that’s it in a nutshell. Today I ask the following question: In creating a narrative from evidence, is what lawyers do that different from what CF doctors do? Read the forums on cysticfibrosis.com. Different treatment methods fill the virtual pages, causing confusion and discussion. Some doctors prescribe steroids; some don’t. Some prescribe Pulmozyme before HTS; some don’t. Some prescribe Cipro three times a day; some don’t. You get the idea. 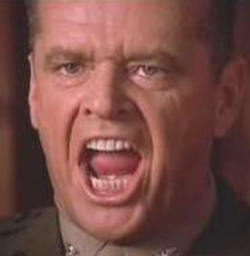 Remember Jack Nicholson in A Few Good Men – “You can’t handle the truth.” You’re right, Jack, I can’t. That’s because, as I’ve written before, the truth does not equal fact. Truth is a myth, often overrated and sometimes a lie. To tell you the truth, it is one’s interpretation of the evidence. When a witness offers to tell the truth and nothing but the truth, they do, but it doesn’t mean they were accurate. Witness accounts are often proven incorrect. @CFFatboy wrote an excellent post last week describing how his doctor was going to put him on Cayston every day with no off-months and with alternating months of colistin. Cayston everyday? Not one month on, one month off? My doctor coughed up a hairball with I suggested two inhaled meds at once, even though my logic was that we do it with IV meds, why not inhaled? I’m not saying one method is right or wrong. It just shows the challenge of deciphering competing CF narratives. If I had a dozen CF doctors taking care of me, I could cherry pick from their treatment plans and create one of my own. Treatments for this disease vary to the same degree our genetic defects do. Each doctor works from their evidence: the medical papers, case studies and patient files. From that, he or she creates a treatment plan. And, many times they come up with something based on . . . well, who knows sometimes. Many years ago, I told my doctor that I felt really good taking Ibuprofen. 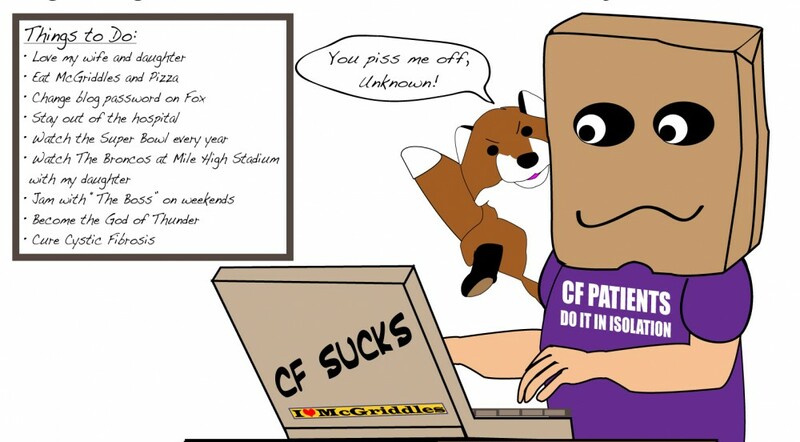 He said he didn’t think it would make any difference but if I liked it “what could it hurt?” which is “doctor talk” for “you have CF so WTF – live it up.” Now there is a page on the CF Foundation web site about Ibuprofen as a possible treatment for CF. I asked him about low testosterone. He said mine was probably fine and no supplementation was needed. Look what we know about cystic fibrosis and testosterone levels now. Treatment may be required. As patients, we may be ahead of a trend because we have Internet access to the evidence, too. With it, we can create our own narrative or truth. And many times we discover it sooner than our doctor who hasn’t read what we’ve read or lived what we have lived. And though I don’t recommend any therapies here, I see that situation developing now with BITC. Once again a potential treatment may be ahead of the curve. What is the truth about this chemical and its potential as a CF treatment? I don’t know. Once I figure out how to get some, I’ll discover what my truth is, so help me God. This entry was posted in cystic fibrosis, Health care and tagged cystic fibrosis, Health care, Isothiocyanates by unknowncystic. Bookmark the permalink. Hey, the only sarcasm allowed here is mine. Well said, as we see cf affects everyone the same yet in different ways.. I have had some cf docs tell me todo one thing this way and another a different.. So I try both and see what makes me feel best..
Nice of you take a minute away from one of your iPad games to comment. 🙂 I think you have a good strategy. It’s really one of my pet peeves about CF – the difference in opinions on how to treat it. Okay, back to your iPad. Thanks for the visit. I have bronchiectasis not CF. However, for years I read the CF and bronch forums and would politely suggest to my pulmo that we try some of the CF treatments (without saying CF, because that flipped him out). I.e. The Internet and people like you drastically improved my quality of life! That is a compliment of the highest order. Very kind of you to say and share. I, too, have learned a lot on the Internet from other CFers. Best regards. I’ll be dropping in to your site later today. This is absolutely the reason I’ve recently signed up and started participation with the study drug NAC. I can’t be a doctor, or a nurse. I won’t land any major diagnostic breakthroughs that I dreamed of when I was younger. However, I can play a large and variable role in the way CF treatments come on the market. To me, this is one of the best things I can be doing. It doesn’t matter if I have a placebo or the real thing. What matters is that I can give information for the researching teams to base their diagnostics off of. In a way, that puts me right on level with those people. I turned down Cayston so I could try the NAC. And, hell! Why not, right? I’m young, my lungs are stubborn but resilient enough. I’m in my prime, and I can help others and pay fierce attention to my daily system of things by always writing in the study journal. The more these things are done the better it makes it for the rest of us. I think that the extra meds and time consumption for something you don’t quite know is real or not is a bit disheartening… however, isn’t that what CF is really all about? We know it’s there. We don’t have a map of our system though. We can be healthy one day, look and feel fine, and the next we get hit as if we somehow woke up underwater. Anyhow, I believe that this back and forth testimony is never quite going to end. But there are some things that will help to ease the tension a bit. Good luck! I really liked this post. This is a really interesting comment, Savannah. It’s cool that you have different studies to choose from, which shows how far research for CF has come. Your comment has given me an idea or two for future posts. Your statement, “We can be healthy one day, look and feel fine, and the next we get hit as if we somehow woke up underwater” is right on the money. Couldn’t have said it better. It’s one of the things I hate most about CF. Example: I usually end up in the hospital over Memorial Day. Yet, today I feel fine. I start to believe I’m going to be okay. Yet, how many times have I thought that only to be coughing up blood the next day. Thanks for sharing your thoughts here on my blog. Much appreciated. I started doing my Pulmozyme twice a day without my doctors knowledge and around the third time I asked for an early prescription they caught on. Sneaky me didn’t tell them, but it had drastically improved my breathing. There was no way to deny the proof like that. Again, I’m not a doctor. But, I can’t help but notice we become our own personal doctors after being around this so much. I’ve read that a good deal of us find pulmozyme twice a day to be beneficial. I think we’re a combination of personal doctors and living experiments. The challenge is trying to figure would which drug or supplement is doing what for us. I take so many, it’s hard to tell. I’ve made choices with my meds, too, that fly outside the norm. I just trust my gut and experience some days and go with that.